This season might need to be graded on a curve. Oklahoma State didn’t make the Final Four this season, but neither did Duke — not bad company. With the Cowboys’ season a few weeks gone, enough time has passed to digest what was. Here are some grades for OSU’s 2018-19 campaign. We’ll start with the obvious: Yor Anei. Anei came to OSU with a lot of upside in his 6-foot-10, 7-foot wingspan frame, but he was raw. He beat out three other freshman bigs for the Game 1 start, but after two games, he conceded that spot to Duncan Demuth for three games. Anei got back in the starting lineup against LSU and never looked back. Anei finished the season with 85 blocks (tying OSU’s single-season record), and he also showed steady improvement on offense and on the boards, finishing the season averaging 7.7 points and 4.8 rebounds a game. His freshman season culminated in a 17-point, 10-rebound, seven-block performance against TCU in the Big 12 Tournament. Up next is point guard Isaac Likekele, who also came in as a long, high-ceiling freshman. Likekele started every game in his first season. He scored in double figures 12 times and had at least five rebounds in 14 games. He also proved to be quite the road warrior, dropping 23 points in Morgantown and Waco. The only non-freshman I’m going to highlight here is Thomas Dziagwa. A lot of question marks surrounded Dziagwa entering the season, primarily on his defensive ability. His defense did marginally improve, but his offense straight up kept OSU in some games. Dziagwa hit 105 3s this season, the third most in a season in school history, and he had three 20-point games in February. Dziagwa hit 25,000 shots this summer and made some body transformations through dieting, and it showed. This is what he did from his sophomore to junior seasons. OSU didn’t win a lot of games this season, but there were a lot of good ones. Look no further than the Cowboys’ final game of the season, where they overcame a 21-point second-half deficit to take their first lead of the game with 25 seconds to go. That’s one bookend, and the other was also quite dramatic. OSU lead Charlotte by 24 with 14 minutes to go. 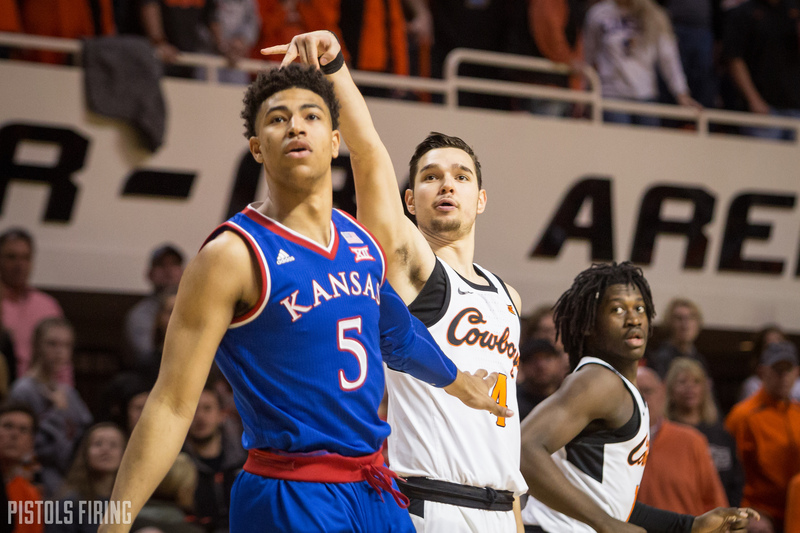 The Pokes lost that lead in the final three seconds thanks to a botched flagrant foul call. The craziest game the Cowboys had this season came in Lubbock when Lindy Waters decided he was going to take a Final Four team to overtime by himself, scoring 12 points in 53 seconds. That’s 10 games. Ten of OSU’s 32 games were decided within five points. Seven of OSU’s 20 losses were within five points. OSU was picked to finish 10th in the conference, so finishing ninth is exceeding outside expectations. Many of the Cowboys’ Big 12 games were played with seven available scholarship players, so the fact that the Pokes had the fight they did has to count for something. Yet still, for a program accustomed to making the NCAA Tournament at the minimum, a 12-20 finish isn’t good. Given the circumstances of youth and the curve ball of the midyear dismissals, I don’t think it was a terrible season, but it definitely wasn’t great either.